The Photopopper Photovore Robot Kit is an electronic kit used to build a fun solar powered robot. 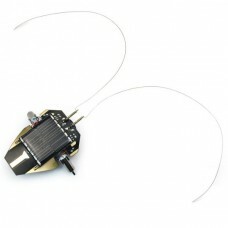 The Photopopper robot is powered entirely by green solar energy. It features an elegant Miller Engine phototropic light seeking obstacle avoiding circuit that keeps the robot active. This little photovore robot has light sensing eyes and a pair of obstacle avoidance sensor whiskers. It uses two small high efficiency motors to dash around at speeds of a meter per minute. The robot's infrared detectors allow it to trace around shadows as it seeks the brightest light. This is an electronic kit that requires basic soldering skills. It includes a twelve page printed instruction manual for easy assembly.